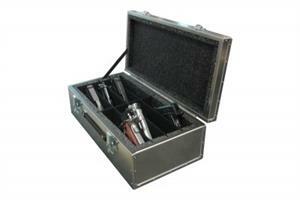 This Aluma-Trans Ultra Lite Series case holds up to eight pistols. Developed for competitive shooters, Law Enforcement Agencies, etc., this case weighs slightly over 9 pounds, has two loop latches that can be padlocked, a weather seal to keep out dust, dirt and moisture and 2 handles. The interior consists of 8 pistol/accessory slots, bordered by 1" of high density cushioning, while the pistol dividers are carpet lined. Interior Dimensions: 9 3/8" x 1 7/8" x 4 3/4"
Exterior Dimensions: 21 3/8" x 10 3/4" x 6 7/8"